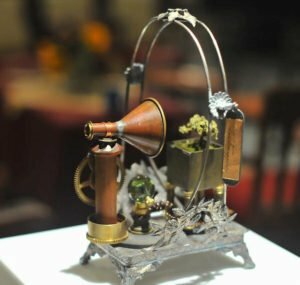 Cogs & Corsets Steampunk Happening brings you all the fun and frivolity you expect from a Steampunk event, surrounded by the historic architecture of Downtown Bloomington, Illinois. Our event has activities and fun for all ages, and most of it is FREE! Now in our third year, Cogs & Corsets just keeps getting better. 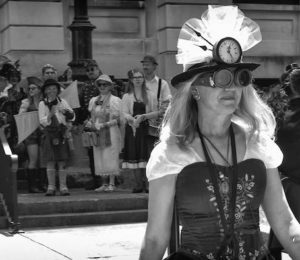 For 2019, our steampunk festival will be sharing the downtown square on Saturday with WGLT’s Free Summer Concert — three amazing jazz/blues acts performing throughout the evening, along with food vendors and libations. This is a weekend you don’t want to miss! Check out the 2019 schedule of events here. Our presentations and workshops are listed here. Peruse our list of fabulous vendors here. … and check out the many contests and competitions below! Show off your Steampunk finery and fashion sense in our costume contest. Prizes awarded for adult, kid, and couple/group categories plus ‘best in show’! Please see our rules here. Entry form is available here or on-site at the Registration booth. It’s time to tap into your creative genius or latent mad scientist inner self! Registration forms are available here or at the Registration booth at the festival. Are you wearing a winning entry on your face? Whether you twirl it like a villain or let it reach awesome lengths, show off your best bearded/mustachioed persona, and win prizes and bragging rights. And if you currently don’t have a beard or mustache, what are you waiting for? Stop shaving and get in the game! A competition like no other! Build your own creative Teapot Racer from a teapot and an RC chassis, then turn it loose on our obstacle course for a timed run through the Ramp of Doom, Tunnel of Terror, and other hazards. Awards for achievements great and small! 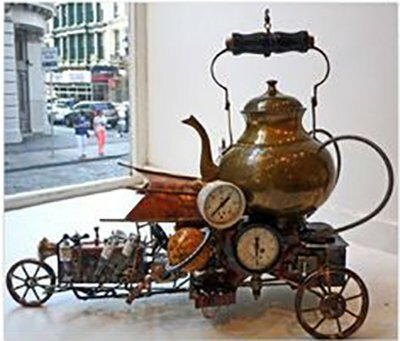 Please see rules and Teapot Racer guidelines here.